Well, here it is. A cardigan being undone. Hours of knitting reduced to a ball of slightly wiggly yarn. Despite how it looks, this was a decision made with joy. I'm not enjoying knitting this cardigan. I'm finding the pattern slightly confusing and I don't like feeling unsure about how a garment that's going to take so many hours of work will turn out in the end. 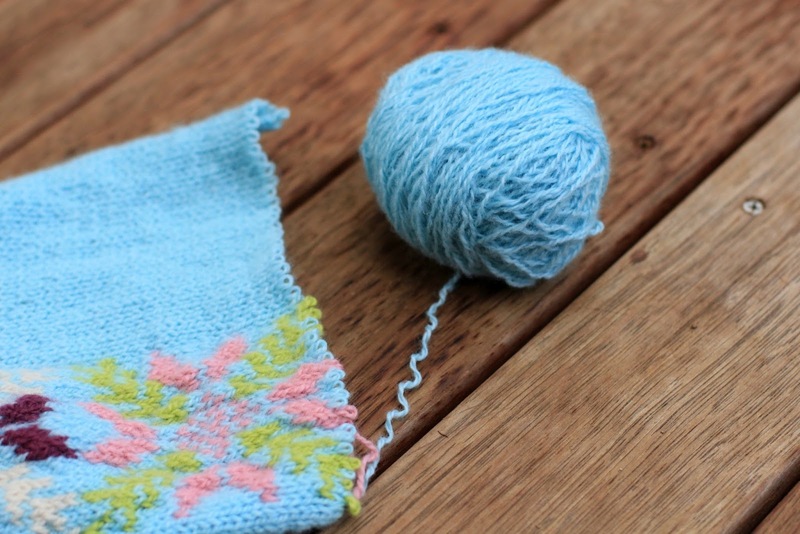 There's a lot of knitting to end up getting to the end and thinking, "Aha! I knew it wasn't going to turn out right". Of course, it may have turned out beautifully. The pattern notes of other knitters on Ravelry all had good things to say about the cardigan, and everyone's looked lovely. But once I start doubting how a project will turn out, I just can't enjoy working on it anymore. My trouble was with the construction of the cardigan. I was enjoying knitting the intarsia pattern very much, but I wasn't sure about the arm and shoulder shaping. I also didn't realise until after I cast on that the button band was knitted separately and sewn on afterwards. I'm the last person to protest at seams in knitting (they don't worry me at all), but it did seem like there was room for error and a fair bit of extra work involved by knitting it separately. So I decided that since I haven't even finished the first right front of the cardigan, I might as well undo it and make something else. 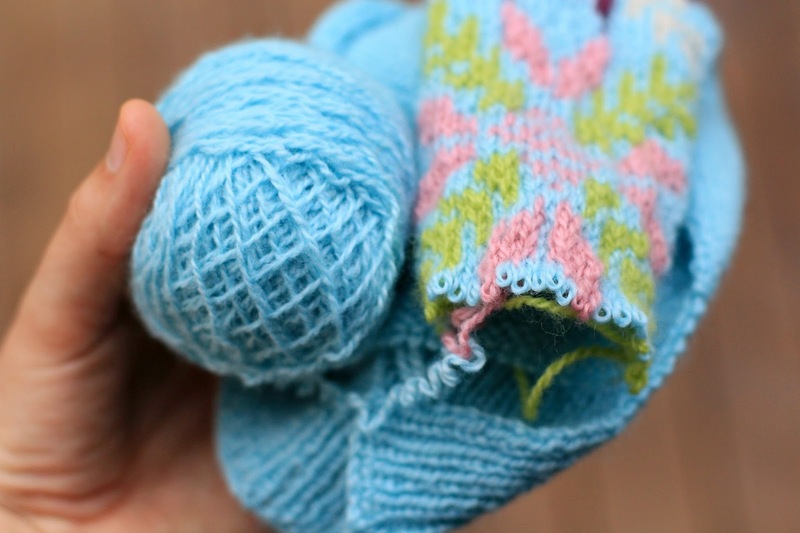 I'm going to use the same blue yarn, because I have a cardigan sized quantity of it, and I love the colour. I haven't quite settled on a pattern yet. I'm actually tempted to knit another Clara Bow Sweater because I loved making that and it's lovely to wear. I also think it would look so pretty in this light blue colour. I'd like to make one that's slightly longer too - it's based off a 1940's pattern where their tops were quite cropped to match their high waisted skirts, and I find my sweater just a few centimetres too short. I find myself pulling it down a lot when I wear it. There's another pattern in the same book that's vying for the position. It's a simple jumper (sweater) with a rounded neck and a ribbed hem, but it's made pretty by the feather stitch that it's knitted in. I haven't quite made up my mind which to do - something completely new, or should I revisit a favourite and make the adjustments I want to to make this second version perfect? Decisions, decisions! Which one would you choose, I wonder? That is such a good quote! I've undo a few projects this year and have always been happy with my change of mind :-) I don't think anything is ever a waste of time, you usually learn something along the way. I like the pattern but there is no point in sitting down for hours on end to work on something you don't enjoy. I am working on a ten stitch blanket, it took me ages to figure out how to make it but in the end it is totally worth it. I hope you will feel like that in the end whatever you choose to do.